Oxford, Ohio (Jan. 30) – The #1 Miami RedHawks finished off a weekend sweep of Western Michigan by defeating the Broncos 2-1 at Steve Cady Arena Saturday night. Bronco senior netminder Riley Gill nearly stole at least a point by stopping 47 Miami shots but a late powerplay goal from junior Andy Miele with just over four minutes remaining in the third period enabled Miami to emerge unscathed. Sophomore Connor Knapp was relatively untested as the RedHawk defense corps once again bottled up the opposition. Knapp made just 15 saves in registering his fifth win of the season lowering his goals-against average to 1.86. Miami improves to 18-4-6 overall and 15-4-4-2 CCHA opening a 10-point lead over second place Michigan State in the league standings. In addition, with Robert Morris’ win over Bemidji State, Miami has regained the top spot in the Pairwise rankings to themselves but Denver is closing fast in the nice to look at, but essentially meaningless, KRACH computer rankings with their weekend sweep of North Dakota. In attempting to predict when Miami could possibly seal the CCHA regular season title, the math is a bit “fuzzy,” but here’s what we know. Miami cannot technically clinch until at least the Bowling Green series on February 12-13 unless Ferris State is swept this weekend and Michigan State loses one. Here are the games remaining and the maximum possible league points for the current top four. To get to 63 points, and close out everyone else, Miami needs four wins (remember, CCHA regulation wins are worth three points). But, the number assumes that Ferris and MSU win every night. If Miami sweeps Lake Superior State this weekend, Ferris is swept by Northern Michigan and MSU splits, Miami would clinch the regular season title this weekend at Steve Cady Arena in Oxford, Ohio. Miami is back in action this Friday and Saturday, February 5-6 vs. Lake Superior State in Oxford. #1 Miami held serve at home Friday night with the RedHawks knocking off CCHA basement dweller, Western Michigan 4-1. Four different Hawks scored goals for Miami while Cody Reichard delivered another outstanding performance in net making 18 saves as Miami dominated the shots on goal category outshooting Western 43-19. Miami retains its 7 point lead in the CCHA standings as Michigan State defeated Michigan 3-2. Defensemen Cameron Schilling and Chris Wideman staked the Hawks to a 2-0 lead before Western’s Luke Witkowski would capitalize on a powerplay to pull the Broncos to within one early in the second period. However, Miami would receive goals from Reilly Smith and Carter Camper to ice the game. Miami and Western Michigan return to the ice at 5pm this evening. The game will be televised on FSN Detroit as part of it’s doubleheader coverage of “Hockey Day in Michigan.” Miami head coach Enrico Blasi and the RedHawk program were followed yesterday by an FSN camera crew and they will be featured on “CCHA All-Access” on FSN Detroit immediately following the game. The late game will feature Michigan State and Michigan from Joe Louis Arena in Detroit, Mich.
Fairbanks, Alaska (Jan. 22) – In what was a bit of a sloppy game, #2 Miami overcame a one-goal first period deficit to secure a 1-1 tie with the Alaska Nanooks on Friday night in Fairbanks, Alaska. The RedHawks would earn an extra point in the CCHA standings by winning the shootout 1-0 as sophomore Cody Reichard stopped all three Alaska shooters and senior Jared Palmer’s slick backhand beat Nanook netminder Scott Greenham on Miami’s first attempt. After roughly 20 hours of travel for the RedHawks, Alaska would find the net first with just 28 seconds remaining in the first period as defenseman Aaron Gens scored a powerplay goal. Gens received a blind, backhanded pass from Dion Knelsen through the slot to convert a diving redirection that just slipped under Reichard’s glove as he moved from his right to his left in an attempt to make the save. Miami managed just four shots on goal in the first period as they struggled to regain their legs. Miami would tie the score just 2:52 into the second period also via the powerplay as junior Pat Cannone scored his seventh goal of the season assisted by classmates Carter Camper and Tommy Wingels. From a puck possession and territorial standpoint, Miami dominated the second and third periods but was unable to register many quality scoring chances, and when they did, Greenham was there for Alaska. On the night, Miami sent just 24 shots on net while holding the Nanooks to only 21. It was a typical defensive effort for two teams ranked in the top 20 nationally in team defense. Tonight, Miami returns to the Carlson Center to face the Nanooks for the final time in the regular season and will benefit from Andy Miele’s return to the lineup after a one-game absence. Faceoff is 11pm EST from Fairbanks. Miami is now 15-4-6 overall, 12-1-4-2 CCHA. They are four points ahead of second place Michigan State with two games at hand on the Spartans who defeated Ohio State 5-2 picking up a point on the RedHawks in the CCHA standings. #1 Denver at #3 Wisconsin – In the marquee matchup of the weekend, #1 Denver and #3 Wisconsin skated to a 3-3 tie in Madison. The Pioneers led 2-0 early in the third only to surrender three consecutive Badger goals to trail 3-2 late. Anthony Maini would tally with just 1:56 remaining to send the game to overtime where it ended 3-3. #8 Ferris State at Michigan – After dropping a pair of games last weekend vs. #2 Miami, Ferris State headed to Ann Arbor for the first of a home-and-home. However, the suddenly surging Wolverines sent the Bulldogs back to Big Rapids with their second shutout loss in the past three games as Michigan won 2-0. The teams will complete the series tonight in Big Rapids, Mich. Ferris State is suddenly eight points behind Miami after entering last weekend’s series tied with the RedHawks for first place in the CCHA. #9 Cornell 1, #5 North Dakota 0 – The Big Red mustered just 15 shots but came away with the victory at Lynah Ice Arena in Ithaca, N.Y. This was a big win for Cornell who is continually dismissed by writers and fans of the WCHA for being unworthy of their top 10 ranking. #12 St. Cloud State 4, Minnesota 3 – The Huskies get the win to continue their ascent up the Pairwise and WCHA standings. #14 Bemidji State 4, #4 Minnesota-Duluth 1 – The Beavers got back on track defeating the Bulldogs in their final meeting in Bemidji’s John Glas Fieldhouse before joining the WCHA as a full-time member in the new $44 million Bemidji Regional Events Center next year. The Beavers are fourth in the current Pairwise rankings which would earn them a #1 seed in the NCAA tournament if the season ended today. It’s going to be a quick preview this week as I’ve been cavorting in Fabulous Las Vegas for the past several days. Thankfully, I’m still on Pacific time as the #2 Miami RedHawks take on the Alaska Nanooks at 11PM EST from frigid Fairbanks where it’s minus 4 degrees Fahrenheit. It’s going to be a late weekend of hockey. Last week the RedHawks (15-4-5, 12-1-3-1 1st CCHA) rebounded from a pair of losses to Robert Morris by sweeping then #6 Ferris State in Big Rapids, Mich. where the Bulldogs were 11-0 this season. After Friday’s 4-0 whitewash, Miami opened up a 5-2 lead early in the third period and held off a late Ferris State rally winning 5-4. However, in doing so, the RedHawks will be without fourth-leading scorer, junior Andy Miele (8-13-21, +11), who was assessed a game disqualification penalty for kicking during a scrum in front of the Ferris net on Saturday. The penalty carries an automatic one game suspension meaning Miele will make the trip to the Land of the Midnight Sun for just one game. Miele has played in 83 consecutive matches for the Red and White. Alaska (10-7-5, 7-7-4-4 5th CCHA) enters the series coming off a two-point weekend against the Michigan Wolverines where they were blanked 6-0 on Friday, but managed a shootout win on Saturday at Yost Ice Arena in Ann Arbor, Mich. Upfront, the Nanooks are led by freshman Andy Taranto (9-15-24) and senior Dion Knelsen (11-9-20) and backstopped by sophomore Scott Greenham (10-7-5, 2.43, .911). Last season, the Nanooks surprised many by finishing in fourth place during the regular season earning a first-round playoff bye. They then dispatched the Ohio State Buckeyes in the second round earning a trip to Joe Louis Arena where they were defeated by Notre Dame and Northern Michigan. Second year coach Dallas Ferguson has instilled a defense-first approach and the two teams split a series in Oxford last year. Tomorrow, we’ll have recaps of Miami/Alaska and an overview of other action including #1 Denver and #3 Wisconsin from Madison. Well, it might not be the sexiest matchup, but the #1 Miami RedHawks finally return to the ice on Friday night for the first time since finishing off a sweep of Ohio State on December 12 in Oxford. The RedHawks will particpate in the 2010 Pittsburgh College Hockey Showcase facing Robert Morris University of College Hockey America. The day of hockey will feature the RMU women’s team against UConn at 2pm followed by RMU club hockey at 5pm against Penn State while the nation’s number one ranked team will face the varsity Colonials at 8pm from Mellon Arena in downtown Pittsburgh. The teams will complete the back end of the home-and-home on Sunday at 4pm from Steve Cady Arena in Oxford. Sunday’s game will be televised across the great state of Ohio on ONN. The last time we saw the Miami RedHawks, they were finishing the back end of a home-and-home with Ohio State sweeping the Buckeyes 6-0 and 4-2. Currently, Miami is riding a five-game unbeaten streak that includes CCHA league series sweeps against Ohio State and Notre Dame, and a tie against current #5 North Dakota in Grand Forks, N.D. The RedHawks enter the weekend perched atop all three major polls (USCHO, USA Today, INCH), are ranked first in the KRACH ratings (a sophisticated computer model) and first in the Pairwise rankings that simulate the NCAA’s RPI ratings that largely determine the participants in the NCAA Tournament. To suggest the first half of the season was successful would be an understatement. But, that brings us to the subject of the second half of the season which has become known by some as the “Rico Swoon” in honor of head coach Enrico Blasi’s less than overwhelming second half coaching record. In particular, the first ten games after the winter holiday break have been the most difficult for even the best Miami teams over the years. Here’s a look at Miami’s record in the first ten games after the winter break/the start of the second half of each season since 1999-2000*. So, since 1999-2000, Miami is an average 48-41-11 in the first ten games of the second half of the season. As it is, Miami is currently 13-2-5 and atop the CCHA standings. Last year, Miami started fast at 12-3-3, but underperformed during January and early February effectively eliminating themselves from the CCHA regular season title chase falling well off the pace that was being set by Notre Dame. And, the first two games of last year were in the now defunct Ohio Hockey Classic with Miami losing to Clarkson of the ECAC and Army of Atlantic Hockey. These were games that Miami was heavily favored to win. This year’s opponent to kick off the second half, Robert Morris University, enters Friday’s game a dismal 3-12-3 in the final season of College Hockey America (the Colonials will join Atlantic Hockey beginning next season). Amazingly, RMU is in second place in the CHA with a league record of 1-4-2 though they are a distant second as Bemidji State is 8-0 in conference play. Furthermore, the Colonials score just 2.67 goals per game while allowing an average of 4.06 goals per game meaning their defense and goaltending simply aren’t getting the job done for them. Conversely, Miami leads the nation in team defense having allowed just 34 goals in 20 games (1.70 goals-against average). But, if you take away two games where they allowed five goals to New Hampshire and North Dakota, Miami has allowed just 24 goals, or an average of 1.33 goals per game in the other 18 contests. That, my friends, is team defense. Sophomore goaltender Cody Reichard leads the nation in goals-against average at 1.34, he is second in save percentage at 93.8 and is tied for second in shutouts (3) and should get the start for Miami on Friday night. Sophomore Connor Knapp (2.18, .913) is no slouch either and will likely play Sunday in Oxford. Offensively, the Colonials are led upfront by juniors Nathan Longpre (8-13-21) and Chris Kushneriuk (9-11-20) while junior Denny Urban anchors a porous defense corps posting 5-7-12 in 18 games. Miami continues to be paced offensively by the stellar junior class led by Andy Miele (7-12-19) and captain Tommy Wingels (10-8-18) while sophomore Cameron Schilling leads the defensemen in scoring with 1-9-10. While no Miami skaters appear in the nation’s top 40 scorers, Miami is evenly balanced across four lines with seven players having recorded ten or more points in the season’s first twenty games. 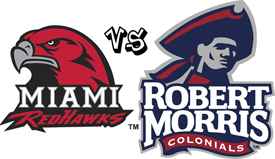 It will be a challenge for Robert Morris to defend Miami for 60 minutes. While the stats and records all point to a Miami sweep, the Rico Swoon cannot be overlooked. Will Miami return from a month-long break as focused as the team that ended the decade with three shutouts in their last four games. Or, will they struggle to regain the momentum that’s often lost in visits home for Christmas dinner and gifts? The Colonials are the second team Miami has faced from the CHA this season with the other coming against current #10 Bemidji State in a rematch of last year’s national semifinal that was won 4-1 by Miami in Washington. The Beavers handed Miami their only loss in regulation by a 3-2 score and gained a measure of revenge against the RedHawks over the Thanksgiving holiday weekend. Miami has appeared on a mission from the outset of the season. But, with road trips to #11 Ferris State and Alaska looming over the next two weekends, the RedHawks must take advantage of these two games against a seemingly weaker opponent to get the second half off to a good start. Accordingly, Miami cannot afford to come out flat, and yet, they cannot look ahead to the showdown with Ferris State next weekend. Enrico Blasi has had his men focused all year and I think that continues against Robert Morris.